This is another opportunity in Porto to do a beach/oceanside run. It’s a pleasant 4 km one-way run between Foz and the seaside town of Matosinhos. The straightforward route follows the main road along the water, with great ocean views. There’s a wide pedestrian/bike path nearly the whole way. This is also one of the more runnable beaches in Porto, with firm sand. A good starting point is the Fort in Foz. Head north. 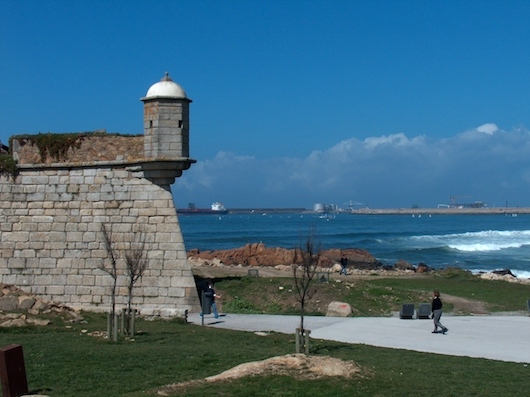 At the 2.4 km point is the Castelo do Queijo, a turreted 17th-century fort sitting on a prominent rock overlooking the beach. Just to the east of there is City Park, which is a great spot to add-on to your run. The run ends in Matosinhos. If you prefer a one-way, there are metro stops that can take you back to Porto. Note: Not a lot of shade, so use caution on hot days.